Its Possible that you may have kept the Swiss ball at your place for ages but the real question is that how many moves do you really know which could be done on your Swiss ball. We are here giving you the four simple moves which will definitely liven up your ball control and these moves help you target on each and every inch of your body. You should aim for doing three sets of 15 repeats of each move. It will help you a lot in effecting your body and giving you the fit personality. Works on obliques and core and its a exercise for beginner. A. Firstly lie on the ball in a bridge position. Now clasp your hands, put your arms straight directly above your chest as you can see in the image. B. Now, what you have to do is to rotate your torso to one side then the other, allowing the ball to roll under you. You should engage your core and legs to control the rotation. C. To give an extra attraction to this very beginners move, you can also hold a dumbbell. Its an intermediate move which works on core, thighs and arms. A. Firstly start in a press- up position with both feet balanced on the ball. B. Now you need to bend your right knee and bring your right leg as close as you can take it to your right armpit, but without letting your belly/ stomach drop as shown in the image. C. Now return your right leg to the ball, and repeat the same step with your left leg. Its an intermediate move which works on core and inner thighs. B. Now lift your hands to pass the ball to your legs. 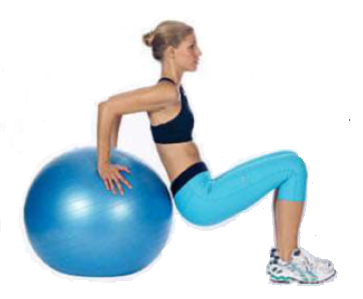 C. Now you need to squeeze the ball and lower your leg with the ball in between your legs to the ground, keeping your upper body raised. D. Now lift your legs to pass the ball back into your hands. E. To start again lower your arms back then repeat the exercise. Its a advanced move which works on your arms and chest. A. Firstly sit on the ball with your knees and feet together. Now place your hands behind you with your palms pressed against the ball. C. You have to take care of the fact that you can not let your bu touch the ball or the floor.